Preheat the oven to 450ºF. Combine the flour, salt, and baking powder thoroughly. Then add the shortening in and work it into the dry mix with a pastry blender or two knives. Dissolve the sugar and the ginger into the milk, then pour that into the flour mix and stir in. It should make a soft, not sticky, dough. The recipe says you might not need all the milk, but in my experience, I did; the quantities were perfect. 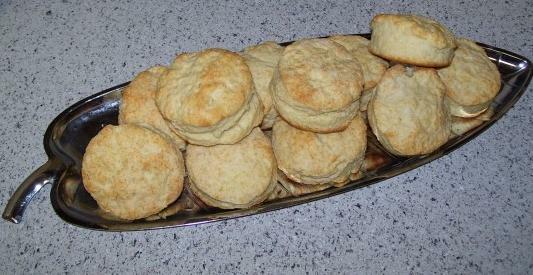 Knead, cut 2-inch biscuits, and put 1 inch apart on an ungreased baking sheet. Bake for 8 to 10 minutes. NOTE: I did notice the bottoms burned just slightly when I baked them. You might consider lowering the temperature to 425ºF for this if your oven tends to burn things.